Few may remember the great Bronko Nagurski, but most have heard the name. His football cards and autographed memorabilia command top-dollar. Nagurski is an original member of the Pro Football Hall of Fame and helped the evolution of the sport in its early days. He played his entire nine-year career with one of the league's founding members, the Chicago Bears. A gifted athlete, his size and power set the bar for future running backs. In later years, Nagurski also wrestled professionally. The Bronco Nagurski rookie card comes from the iconic 1935 National Chicle Football set. Other early paper collectibles of the great back include a Diamond matchbook cover issued in 1934. Nagurski currently has had no memorabilia cards but does have several cut signature cards. His first are from 1999 Upper Deck Century Legends and 1999 SP Football. Autographed Bronko Nagurski items are very rare, and very expensive. Game-used equipment from his playing days is almost non-existent. Photographic prints are available on the secondary market, however, the samples that carry the real value are original first-generation photographs. 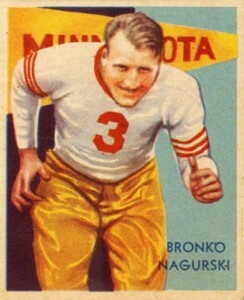 Card number 34 of the 36 card set, the Bronko Nagurski's rookie card features him from his All-American playing days at the University of Minnesota. The National Chicle set is one of the most popular from the pre-war era. Samples in even mid-range condition can sell for tens of thousands of dollars. 1936 Diamond Matchbooks Bronko Nagurski "Complete" SHARP!! SGC !! 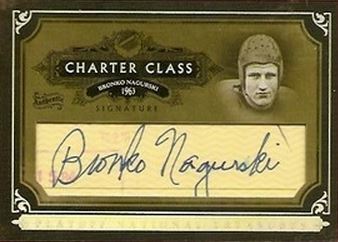 Below you will find examples of what an authentic Bronko Nagurski autograph looks like. This can be used as a first point of reference for determining the legitimacy of autograph memorabilia, but is not a substitute for having your items authenticated by a well-respected professional autograph authentication company. Some of the trusted sources within the sports memorabilia market include the following companies: PSA, JSA. Click on any of the images below to view full size photos. A fairly legible and even handed signature written on an even horizontal plane with a distinct lean to the right. The letter "B" often varies in the rounded-ness or lack-there-of in the loops. The spacing between the letters is very narrow, particularly on items signed in his later years. The "N" can be mistaken for an "H."
The tail of the "g" drops well below the horizontal plane. The pen lifts to start the "u" and remaining letters. The second "k" is more traditionally written than the first. The "i" is usually dotted. Given the rare nature of Bronko Nagurski's autograph, we recommend that those collectors looking to acquire a Nagurski signature, only purchase certified items or cut signature football cards. 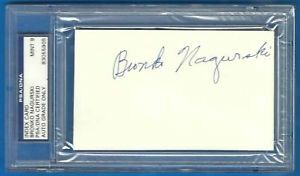 BRONKO NAGURSKI AUTO AUTOGRAPH SIGNED CHECK CHICAGO BEARS HOF PSA DNA COA RARE!